I know we're all in the midst of creating for the upcoming seasonal occasions: Halloween, Thanksgiving and Christmas. But, hey, no matter what the season, there is always SOMEone SOMEwhere having a birthday, so you'll always need to have birthday cards on hand. Right? I love the bright-and-cheery color combination! Whisper White, Marina Mist, and Crushed Curry. Mmmm-good. The cute birthday cake from the photopolymer set, Endless Birthday Wishes, worked so well for paper piecing. You all know how I love to do that! I used the Little Letters Thinlits in my Big Shot for the "WISH" sentiment. Cute and happy, eh? Fold a 8 1/2" x 5 1/2" piece of Marina Mist cardstock in half, creasing well with a bone folder. Run a 4" x 5 1/4" piece of Whisper White cardstock through the Big Shot inside the Large Polka Dot Embossing Folder. Round the corners of this piece and adhere it to the card front. Create a tag from Crushed Curry cardstock with the Chalk Talk Framelits in the Big Shot. Rub the tag well with the Embossing Buddy. In VersaMark, stamp the confetti from the Endless Birthday Wishes stamp set randomly around the edges of the tag. Emboss with White Embossing Powder with the Heat Tool. Stamp the birthday cake in Black StazOn on a scrap of Whisper White. BUT, ink up the flames on the candles with the Crushed Curry Stampin' Write Marker, remembering to HUFF on it before stamping. Then stamp it on the DSP you have chosen for your cake, and once again on a scrap of Crushed Curry. Carefully cut out the cake on the DSP and the cake stand on the Crushed Curry. Glue them in place over the original stamped image. Add Dazzling Diamonds glitter to the candle flames. Cut out this piece with the Apothecary Accents Framelit. 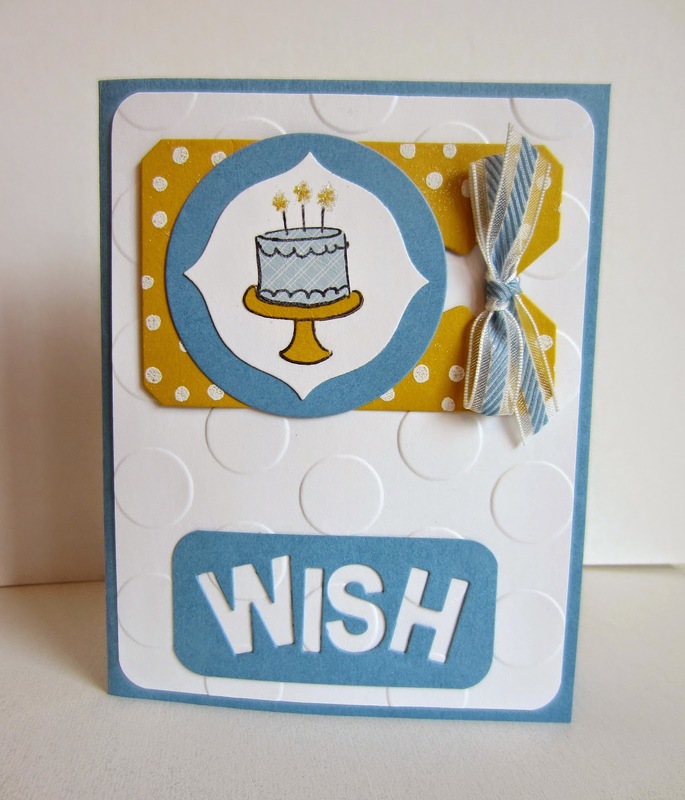 From Marina Mist cardstock, cut a 2 3/8" circle using the Circles Collection Framelits. Adhere the cake piece onto the blue, then attach the circle to the tag. 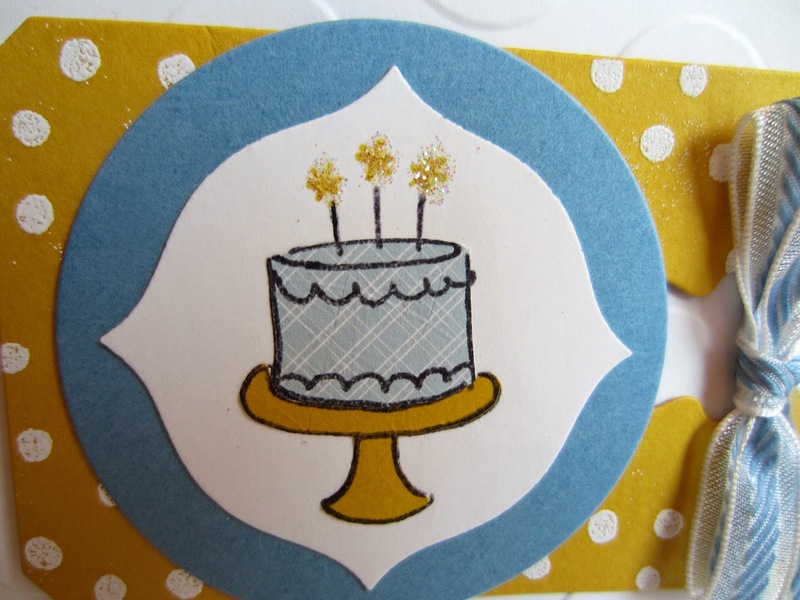 Attach the tag to the card front with Stampin' Dimensionals. Create a bow from the Marina Mist ribbon and attach it to the tag with a Glue Dot. 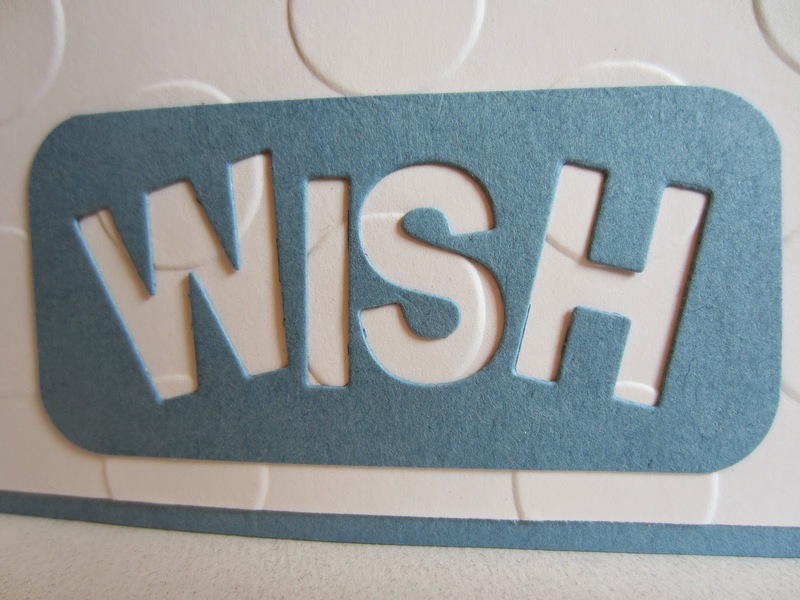 Using the Magnetic Platform, place the letters for WISH on a 2 7/8" x 1 3/8" piece of Marina Mist cardstock. Run it through the Big Shot. Remove the letters carefully with the Paper Piercing Tool. Save these letters for another project! Round the corners, and adhere it to the card front. In Marina Mist, stamp your sentiment inside the card. What a lovely card! Thanks for the tutorial and thank you for visiting my blog! What a delightful card, Linda! I'm especially excited because I have almost all the supplies to recreate it -- and the Little Letters Thinlits should be here in about a week. Hooray! I really like how you placed the letters in a scattered fashion rather than lined up perfectly. As always, thanks for sharing your creations! Excellent tutorial for creating the card. Several of the tips could be used for other genres of paper art. Thank you for sharing the b-day card with us at Make It Monday. Oh my gosh. I love how simple yet adorable this is! That's such a cute card and so easy to do! I love those giant embossed polka dots on the background! I'm so glad you shared your post at the Make it Monday Party! Hope to see you again next week. Love the card and colors! Lovely birthday card!! I saw your card on 'Off The Hook' and thought I'd stop by to say hi to another papercrafter! Yes, bright and cheery! What a lovely birthday card.